Donor Advised Funds – a Tax Efficient Way to Give to Charity. A Donor Advised Fund is like a charitable investment account, for the sole purpose of supporting charitable organizations you care about. You can contribute cash, shares of stocks or mutual funds, or other kinds of assets to a DAF and get an immediate tax deduction for the whole amount. Under the new tax law, far fewer people will be itemizing their deductions. But if you contribute a large amount (say several years of your usual charitable donations) to a Donor Advised Fund you might still itemize your deductions in the year you contribute. A Donor Advised Fund can be an especially useful tool if you have an unusually high-income year that puts you in a higher tax bracket. Not a bad problem to have! With the recent run-up in the stock market, many people have appreciated shares of stocks or mutual funds in their non-retirement investment accounts. You can donate these appreciated shares and pay no capital gains tax on the gain. Once you’ve established your account at the DAF you make “grants” from your account to the charities of your choice. You can give to any IRS-designated 501(c)(3) charity. 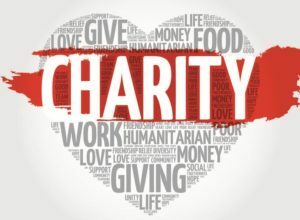 Most charities are already in the DAF’s database, but if you choose a charity that is not, the DAF will perform due diligence to make sure the charity is eligible. You can grant as little or as much as you want each year. You can invest your account in an array of different investment choices. The dividends, interest, and capital gains of these investments are not taxed. Your contributions to the Donor Advised Fund are irrevocable. You cannot get the money back, it must be donated to an IRS-designated 501(c)(3) charity. Making “grants” (donating to the charity of your choice) is very easy and convenient. You do it online. You can easily set up repeating grants such as a monthly gift to your place of worship. The funds charge a modest administrative fee. Typically around .6% of assets. Fidelity Charitable DAF has a minimum initial contribution amount of $5,000 and a minimum grant amount of $50. Schwab’s Charitable DAF also has a minimum initial contribution amount of $5,000 and a minimum grant amount of $50. If you regularly contribute to charity, using a Donor Advised Fund could save you money – allowing you to give more to the causes you care about!